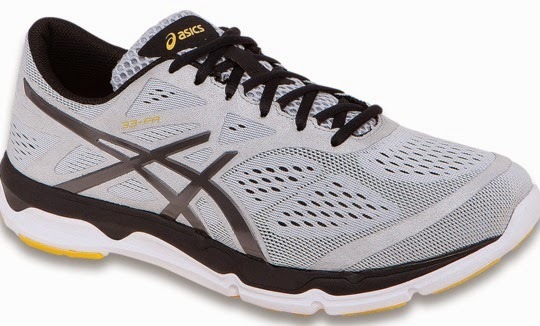 The ASICS 33-FA trainer is an 8.9oz (252gram) 25mm heel/21 mm forefoot lighter trainer in Asics 33- Fx line. $110 MSRP. The 33-DFA is a lighter version and the 33-M a heavier version. I picked the middle child, the 33-FA, as it fits my preferences more closely for a decently cushioned yet sub 9 oz road trainer. more naturally lasted shoes with seamless uppers and simple mid and outsole construction. "Seamless Construction and the oblique-shaped Natural33™ last create a truly slipper-like fit and feel. New forefoot flex groove geometry and FluidAxis® complement the ultra soft AmpliFoam™ platform for smooth flexibility from heel to toe." Do they succeed in joining the party with the 33-FA? I say, Yes. not quite as light as some of the similar competition I have recently run and reviewed such as the NB Fresh Foam Zante(8.1oz), Saucony Zealot (8.3oz), Nike Lunar Tempo(6.8oz), adidas Boston Boost(8.5oz) and Skechers GoRun Ride 4(7.8oz). This said the 33-FA has considerably more durable outsole coverage than most of these shoes and while outsole adds weight it can add more miles of use. Links to reviews of all of these can be found at my summary page here. 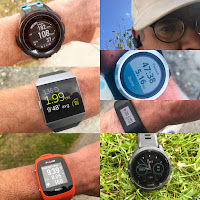 a ride on the firmer side similar to the New Balance Fresh Foam 980, ISO Zealot, Zante and Pearl Izumi N2 but not as overly jarring as I find the Zante and Zealot heels and the N2 and 980 overall as it appears to me that with the FA layers of foam go from softest under the foot to firmest at the outsole in a gradual progression without sharp differences in firmness. 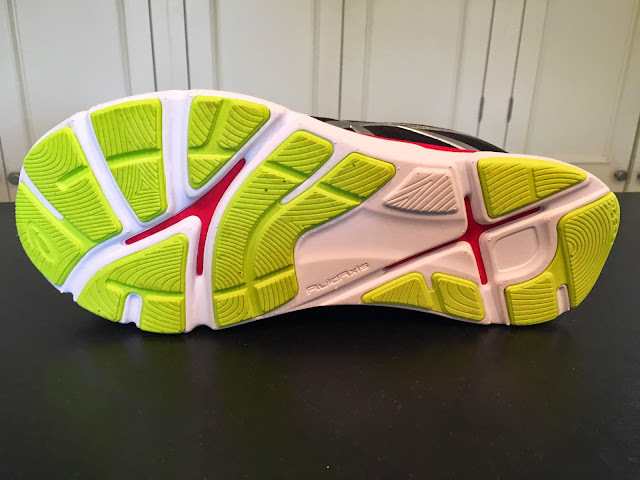 a smooth striding road feel from a well cushioned, firm and stable heel with cuts/cavity through to the soft red foam allowing shock to dissipate, then to an easy transition to the mid foot, but unfortunately, due to all the thick outsole rubber at the toe without the deep grooves, a bit of an awkward stiff push off on uphills in particular. 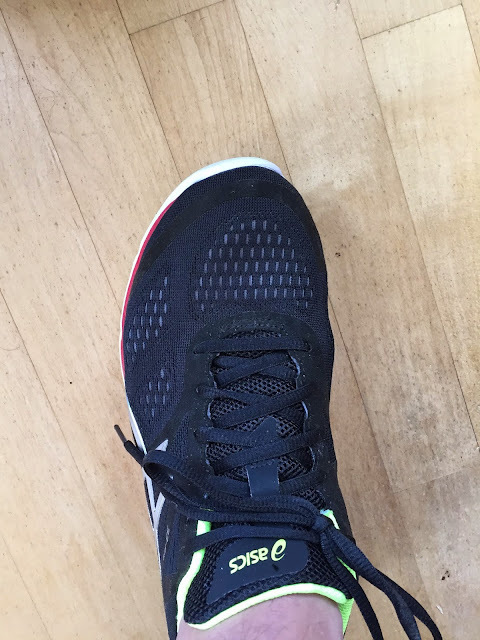 and caveat, as I have not run that many miles in them, a firm, thick and full ASICS AHAR outsole coverage in 2 densities which should allow all foot strike types to get many miles out of a pair. I believe this kind of full dense rubber along with the firm mid sole is what adds weight. Who might like the 33-FA? runners who tend to have heavy outsole wear in strange places. potentially, mild over pronators seeking to transition to a neutral shoe due to the firm midsole and firm outsole coverage. heavier fast runners who tend to compress softer midsoles. I find the FluidAxis approach particularly effective in the heel as despite the firm outsole and midsole shock seems to be well dissipated. The mid foot rides and then flexes nicely with decent snap but the front flex towards the toe is quite stiff, at least so far. The heel outsole material is firmer than the forefoot's. The upper is an engineered mesh similar to the Lunar Tempo or adidas Energy ESM. There are no seams. The front overlays are woven in. Towards the mid foot they are welded or glued over. I find the upper roomy and comfortable. The inner lining seems a bit heavier than what usually lines such mesh upper and loose, not tightly as bonded to the outer mesh. Maybe this helps with flexibility but I worry a bit about creasing and blisters in the toe area. I sized up a half size and except for a bit of pressure by the little toe should have sized true to size. There is no heel counter but even a bit oversized I do not miss it. My foot is well held but the hold cannot be mistaken for the snug race ready feel of the Zante. It more like the Lunar Tempo but a bit wider and roomier and without the dialed in Flywire of the Nike. The 33-FA is a fine light trainer. 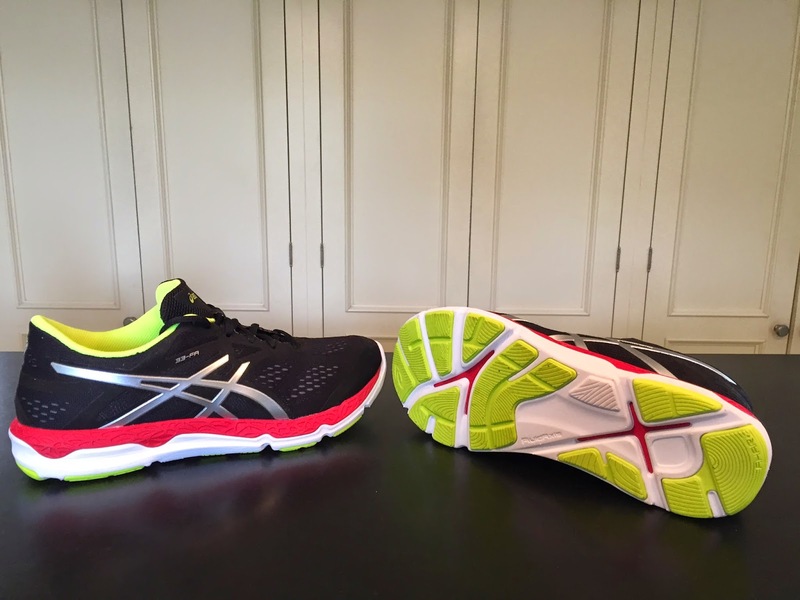 Not quite as light as some of its competitors, it trades some weight for a firmer, and presumably more durable mid and outsole along with extensive full contact outsole coverage on the road. The front fit is roomy and allows the foot to splay nicely. The ride is firm all over but not harsh with all layers of cushioning feeling as one, very smooth but it could use a bit more flexibility towards the toes for me. 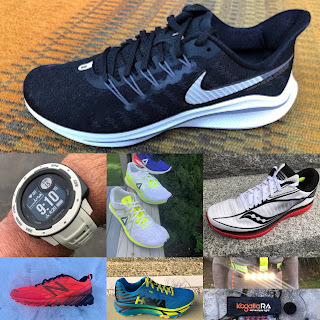 I might recommend the 33-FA for runners who tend to tend to have heavy outsole wear, heel strikers seeking more heel stability, heavier runners who tend to crush midsoles in lighter trainers and those who prefer a firmer ride. The 33-FA was provided to me free of charge. The opinions herein are entirely my own. I review many shoes and much gear and apparel every year. At the link here a summary page with links to all my recent reviews.